The story says that in 628, on March 18, two men fishing in the Sumida river caught in their net a statue of Bodhisattva Kannon, the Goddess of Mercy. Realizing the importance of the statue, the head of their village made a shrine dedicated to Kannon in his own house, where he displayed the statue. 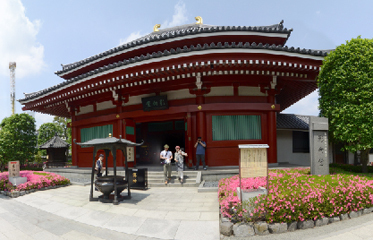 After 7 years, the priest Shokai Shonin enshrined the statue in the newly built Kannon-do Hall, which later became the Senso-ji Temple from Asakusa. An interesting fact is that, after a revelation, he decided that the statue should be hidden from people and this rule remained in place until today. However, 150 years later, a monk named Ennin made an identical replica of the original statue, displaying it and allowing people to worship it, a decision that contributed a lot to the development of the Senso-ji Temple. 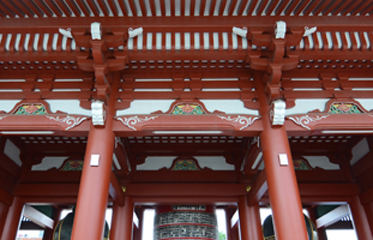 To honour him, at the 1200 anniversary of its birth, in 1994, a dedicated hall was built at the Senso-ji Temple, the Yogodo Hall where this photos were taken.